CONTRA COSTA COUNTY, Calif. (KGO) -- Evacuation orders are in place for everyone in the Curry Point area, which includes Curry Canyon Road and Oak Hill Lane. An evacuation center has been set up at the Clayton Community Library on Clayton Road. The fire is still very active. At last check, it's burned at least 800 to 1,000 acres. The fire was unrelenting, even as the sun went down. Firefighters battled the flames all afternoon. Crews were called to the eastern side of Mt. Diablo, about three miles south of Clayton just after 1 p.m.
Gayle Schwarts was among dozens of homeowners who were told to leave their homes. While petting her dog she said, "She made it out, she's doing good, she's just a little nervous." When asked how she's doing, Schwarts answered, "I'm glad to be out." The Red Cross set up an evacuation center at the Clayton Community Library. Firefighters ordered evacuations for Oak Hill Lane, Curry Canyon Road, and Curry Point. Residents saw flames getting close to their backyards. "And I heard noise coming from below the house," one resident said. "And so I walked out and looked down and you could see the flames coming up the hill." Many residents have several animals on their properties, including horses. Volunteers came to help, bringing horse trailers to transport stranded animals. "The officer told us there's one horse back here that does need to be evacuated and they can't locate the owner so we're going to take the horse back to our ranch in Brentwood," volunteer Steve Henkel said. Firefighters say power lines, cell towers, and 75 structures are in the path of the fire. They hope to make progress overnight. 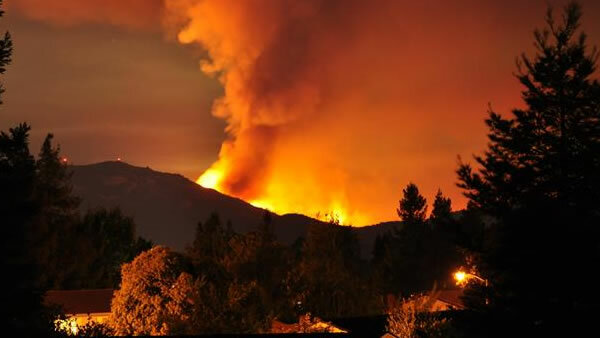 "Temperatures usually go down, humidity rises, it gives us a little bit better chance to get in there and do some direct as well as indirect attack," Said Lewis Broschard with the East Bay Incident Management Team. Residents are keeping their fingers crossed. Resident Nancy Haley has never been through anything like this. "I realize how scary it is, I'm still a little bit scared," she said. The fire is still only 10 percent contained. Only one structure, a cell tower vault, has been damaged so far.